Chase fresh powder in comfort and style this season. A slightly longer progressive fit featuring a gathered hem. Shell V-Science 2-Layer Shell &amp#8226 15,000mm waterproofing / 15,000gm2 breathability. Volcom Zip Tech system keeps the snow out by letting you zip your jacket to your pants. Critically taped seams. Fleece lining. Drawcord cinch hood. Super suede chin guard. Whistle zipper pull. Mesh lined zip vents. Goggle pocket. Noise pocket. Brushed tricot lined handwarmer pockets. V-Science 2 Way Cuff system. Specialty ticket ring. Adjustable powder skirt. Allover camo print design. Branding at center front and on the left sleeve. 100 percent polyester Lining: 100 percent polyester. Machine wash, tumble dry. Imported. Measurements: Length: 33 in Product measurements were taken using size MD. Please note that measurements may vary by size. 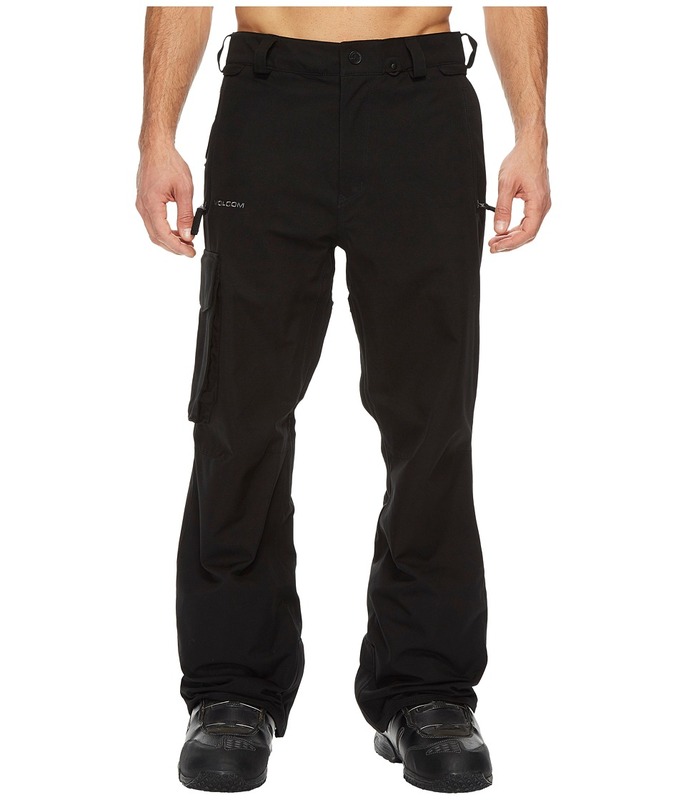 A comfortable pair of snow pants with a classic asymmetrical design in back. Critically taped seams. 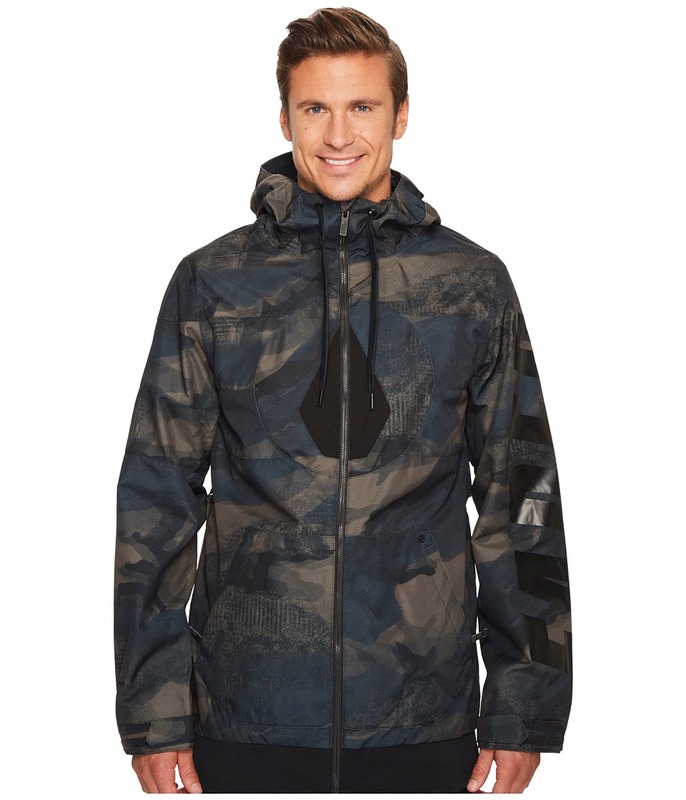 Volcom Zip Tech system keeps the snow out by letting you zip your jacket to your pants. V-Science 2-Layer Shell with Breathable Lining System. &amp#8226 15,000mm waterproofing / 15,000gm2 breathability. Low force, stretchable, highly elastic fabric. Belt loop waistband. Adjustable inner waistband. Zip fly with button closure. Specialty ticket ring. Triple reinforced rise. Brushed tricot lined handwarmer pockets. Welt pocket on back right. Inner thigh mesh backed vents with zip close. Cargo pocket on right leg with flap close. Boot Gaiter with lace hook. V-Science Boot Gusset with snap close. Branding on right leg. 100 percent polyester Lining: 100 percent polyester. Machine wash, tumble dry. Imported. Measurements: Waist Measurement: 34 in Outseam: 43 in Inseam: 32 in Front Rise: 12 in Back Rise: 18 in Leg Opening: 22 in Product measurements were taken using size MD (32-33 Waist). Please note that measurements may vary by size.